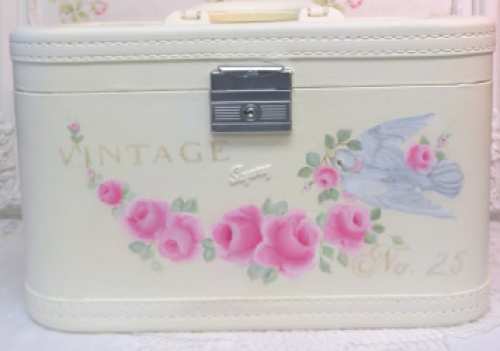 Painted is a category for train cases that have been completely transformed from their former condition. The transformation is to one of beauty. 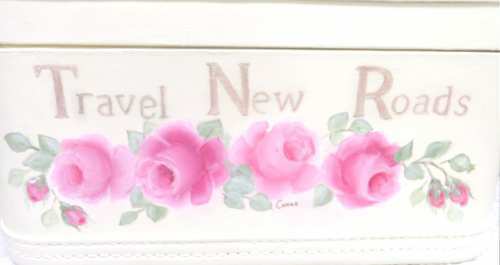 Hand painted roses and stamps of France are the theme of the case with the interior upholstered in rose quilted fabrics and graced with the picture of a lady from the past. 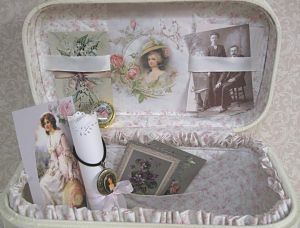 Ribbon in the lid, pocket in the back and tie ribbon are for storing that special postcard or pictures, along with small family treasures. Lovely way to pass along one's life marks such as baptisim, achievement or graduation certificates. All those special items to be given to a special friend or family member.